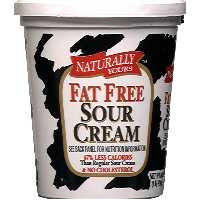 So, one of my long-time favorite diet foods is fat free sour cream. I love the stuff! I have created onion dip with it (and dipped carrots in it), I've put it in low calorie soup, I've put it on pasta, and I've tried it with all sorts of other foods as well. The awesome part, is that fat free sour cream adds flavor and thickness to any meal. It makes meals more filling, and you can usually add it for 0 or .5 WW points. The Knudsen version featured in the picture here is 1 point/serving (big serving), but there are other brands like Naturally Yours (so yummy!) that are only 20 calories for 2 tablespoons! That is 0 points, free yum, for any meal! You can buy fat free sour cream in the dairy section of your local supermarket. I've never seen it at Trader Joes or at Whole Foods (although whole foods has a yummy lesser fat vegan sour cream). Enjoy!